Discussion in 'The Americas' started by brain_dead, Sep 19, 2010. CREECH AIR FORCE BASE: Over two days of briefings here by everyone from pilots to maintainers to the operations group commander of the 432nd Wing, one message rang out loud and clear: the Reaper has grown into a key Close Air Support (CAS) tool for the US military and should not be viewed primarily as an Intelligence, Surveillance, & Reconnaissance (ISR) asset. How well has the MQ-9 performed as a CAS weapon since first being widely used in that way in Sirte, Libya from last August to December? “In an urban CAS environment, we absolutely give the A-10 a run for its money for who is the better urban CAS platform. I realize that is a bold statement, but Colin, our men and women and their equipment are a formidable combination,” 432nd Wing operations commander Col. Joe (we agreed not to use last names for security reasons) tells me in his fairly spartan office on this isolated base. A-10 supporters, whose fervor can sometimes seem religious, need not worry that the MQ-9 is going to supplant the A-10 in other situations — yet. “In other CAS environments though, the MQ-9 isn’t where the A-10 is at. The A-10 has more weapons and the 30mm gun can do things we can’t do,” he concedes, a former F-16 pilot himself. Another factor to take into account with so-called fast-mover aircraft like F-16s, F-18s, B-1s, B-2s and F-15s is that the enemy can hear them coming. The enemy often scatters when they hear the roar of an approaching fighter or bomber, which can be extremely useful. With an MQ-9, “they don’t know we’re there.” That can be useful if the goal of a mission is to kill particular personnel or to wipe out an enemy position — less so if the goal is to scare them off without striking, as was often the case in Afghanistan because of restrictive rules of engagement. In Libya, more than 70 percent of the Reaper strikes were “danger-close” CAS missions, where exquisitely accurate targeting and the lowest amount of collateral damage possible were key. Hellfire missiles, originally designed to be used by attack helicopters, have smaller warheads than bombs and can be carefully guided during a strike to avoid destroying a building. “We dropped 100s of Hellfires and handed that city back to the Libyans intact because we were using highly accurate weapons,” Col. Joe said. Most important, not a single civilian casualty caused by a Reaper strike was reported during the Sirte operations. How close were the enemy and friendly forces? “We had shots as close as 25 meters,” Col. Joe says. One effect of the Reaper’s persistence — its ability to stay over one area for up to 20 hours — was the sense of protection it offered to friendly forces on the ground. “We took MQ-9s and we watched and protected the indigenous forces. If ISIS moved, we were there to alert GNA forces (friendly Libyans) or take action ourselves.” He got an email from a source he would not identify stating that GNA casualties plunged 400 percent after the US started deploying MQ-9s. In fact, Col. Joe is so confident of the Reaper’s CAS and strike proficiency that he thinks the aircraft should be considered a candidate for the Air Force’s low-cost fighter competition known as OA-X. “I think the MQ-9 should throw their hat in the ring for OA-X, yes,” Col. Joe tells me, without elaborating. The proposed initiative is designed (as best we can tell) as a way to fight in permissive environments at much lower cost than would be the case with F-16s, F-15s, F-22s or F-35s. It would also ease the wear and tear on the more advanced fighters which are deploying at much higher rates than they were originally designed for. ARLINGTON, Va. - U.S. military researchers are launching a new project to develop completely new kinds of data storage technologies that operate on the molecular and chemical level to handle vast streams of information from reconnaissance, electronic warfare, (EW), signals intelligence (SIGINT), persistent surveillance, and other data-intensive military applications. Officials of the U.S. Defense Advanced Research Projects Agency (DARPA) in Arlington, Va., have issued a formal solicitation (HR001117S0027) for the Molecular Informatics program, which seeks to develop and test completely new approaches to store and process information with molecules, DARPA officials say. This will require experts from chemistry, computer and information science, mathematics, and chemical and electrical engineering. 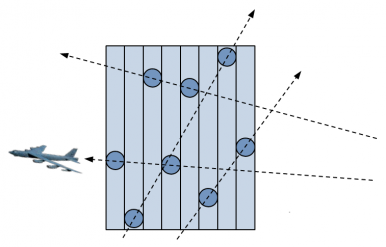 By manipulating properties such as structure, size, charge, and polarity, researchers may develop a vast design space enabling dense data representations and versatile computing concepts that operate outside of the traditional digital and logic- based approach. Data storage and processing is central to U.S. Department of Defense (DOD) activities across areas like platform design and optimization, sensing, mission planning and logistics, and health care. While current computational architectures remain essential, new complementary approaches are necessary to provide advanced capabilities as the complexity and volume of data grows, DARPA researchers say. Chemistry offers a yet-untapped rich palette of molecular diversity that could be harnessed for scalable information storage and processing. Anticipated outcomes of the program include new approaches to represent information and execute computational operations in molecular form; scalable strategies to extract and process information from large molecular data stores; and molecular computing concepts that provide capabilities beyond our conventional computational architectures. The program is trying to enable information processing directly on molecular data to achieve ultra-high information storage densities and inherent parallel processing. Researchers are interested in approaches that capitalize on complex molecular mixtures, non-natural polymers, and other advantages of molecular structures. Among the program's goals are developing data-storage capabilities beyond binary, digital encoding, and serial, logic-based computation. More conventional ideas based on molecular logic gates, biomolecular computing strategies, and those that are inherently not scalable are not part of the Molecular Informatics program. DARPA officials say they plan to award several initial Molecular Informatics contracts. Participants will validate information encoding and processing in the first program phase, and then develop ways to integrate their capabilities and demonstrate processing directly on molecular data in the second program phase. Proposed approaches ultimately must be scalable to encode and process large datasets. Performers will validate their molecular encoding concepts by demonstrating storage densities of at least 1,018 bytes per cubic millimeter with at least 1 gigabyte of data. Molecular Informatics is a three-year program divided into an 18-month first phase and one 18-month optional second phase. By the end of the Molecular Informatics program, performers will project their ultimate capabilities to define future opportunities for molecules in information storage and processing. The Airborne Electronic Attack Systems and EA-6B program office (PMA-234) of the US Naval Air Systems Command (NAVAIR) completed a critical design review (CDR) for the AN/ALQ-249 Next Generation Jammer (NGJ) Increment (Inc) 1 Mid-band program at Naval Air Station Patuxent River, Maryland, in late April. The system is now in the Engineering and Manufacturing Development phase with Raytheon Space and Air Systems, the pod prime contractor, and Boeing, the EA-18G GROWLER aircraft integration prime contractor. The AN/ALQ-249 NGJ Inc 1 Mid-band capability, once fielded, will transform the way the U.S. Navy conducts electronic warfare. Next Generation Jammer (NGJ) Increment 1 Mid-band program at Naval Air Station Patuxent River, Maryland, in late April. During CDR, it was determined that the design and development are on track to meet crucial warfighter requirements, and fabrication, demonstration, and testing could proceed. 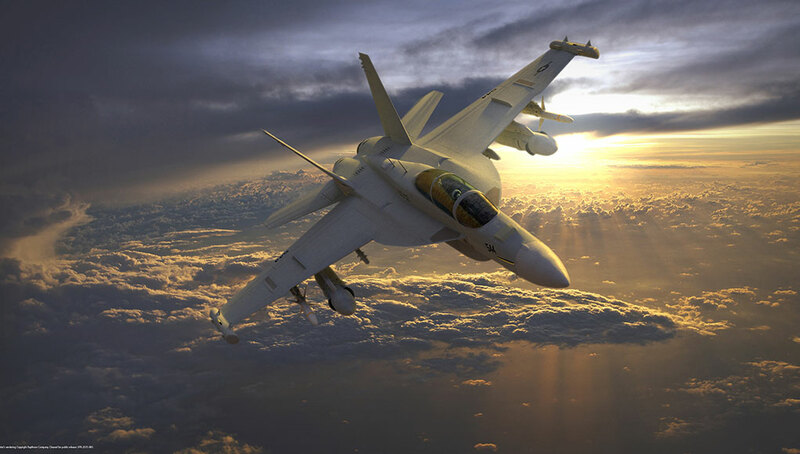 The system is now in the Engineering and Manufacturing Development (EMD) phase with Raytheon Space and Air Systems, the pod prime contractor, and Boeing, the EA-18G aircraft integration prime contractor. The AN/ALQ-249 NGJ Inc 1 Mid-band capability, once fielded, will transform the way the U.S. Navy conducts electronic warfare. The system will address the emerging, advanced threats and increased threat density using the latest Active Electronically Scanned Array, also known as AESA, digital and software-based technologies. 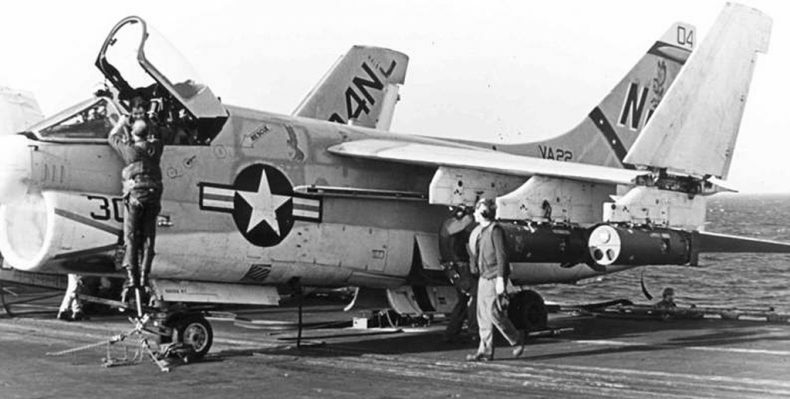 On the morning of May 9, 1972, the USS Coral Sea catapulted a strike package of three A-6 Intruders and six A-7 Corsairs into the morning sky. The aerial campaign against North Vietnam, paused in 1968, had resumed five weeks before in response to the Easter Offensive. Task Force 77, then consisting of six carriers, had been flying combat missions against the North for more than a month, but this mission was different. Slung underneath the wings of the Intruders were 1,000-pound Mk-52 antiship mines. The Corsairs carried the smaller, 500-lb Mk-36. The large mines were destined for the inner channel of Haiphong’s busy harbor, with the smaller ones destined for the outer channel. Operation Pocket Money, the devastatingly effective naval blockade of North Vietnam was on. When the U.S. Navy finally cleared the mines after the Paris Accords that ended the war, the sun set on the air delivered mine. The risk to the minelaying aircraft was too great, a point driven home by the Navy’s last aerial mining mission in 1991, which resulted in the loss of an A-6 and its crew. That all changed in September 2016. 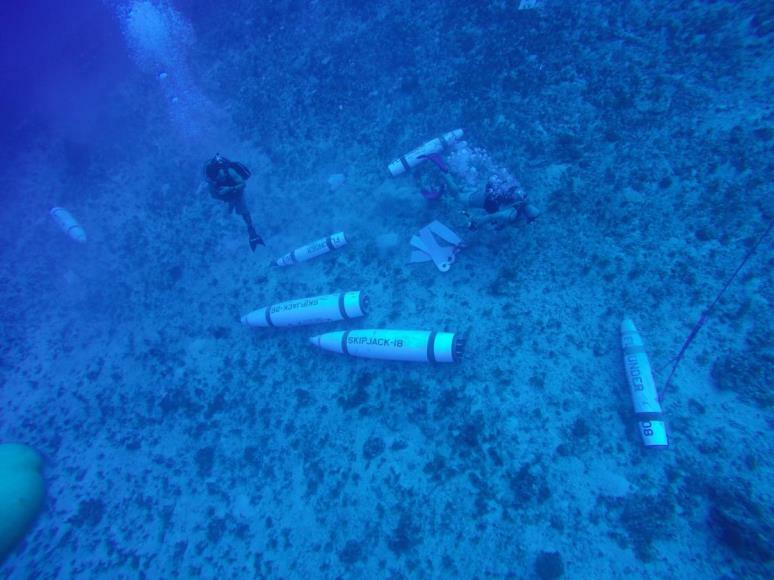 During the biannual Valiant Shield exercise, the United States demonstrated a potentially devastating new mine capability – one that takes advantage of off-the-shelf precision capabilities added to antiship mines. For the first time, the Joint Force can lay a precision minefield in a single pass from any altitude – and can even do it from a distance. The Skipjack JDAM (Joint Direct Attack Munition) variant and the smaller winged extended range Flounders have revolutionized American naval mining capabilities without an extensive and costly development program. In an increasingly globalized world where the lifeblood of many nations flows via global shipping lanes, the potential for these weapons to cripple an adversary’s maritime transport capability offers an asymmetric advantage for U.S. Forces. Sea mines are obviously an antiship weapon, but not necessarily an anti-warship weapon. In World War II, both the British and the United States had emplaced mines defensively, in order to inhibit U-Boat operations in Atlantic waters. The primary use of mine warfare in the Pacific War was offensive, placed to interdict harbors and chokepoints. The vast majority of mines were laid by land-based airpower, interdicting Japanese transport from Rangoon to Japanese home waters. Mines were even hauled over the Himalayas to be laid in the Yangtze River. They were a key part of a maritime interdiction effort that devastated the Japanese merchant marine and dismantled the seaborne flow of resources, starting years before the first B-29 reached the Japanese islands. In the closing months of the war, mines laid by aircraft accounted for more Japanese ships sunk or damaged than all other sources combined. In Vietnam, mining was under consideration from 1964, but was regarded as too escalatory by policymakers in Washington. Admiral Thomas Moorer, as the chief of Naval Operations from 1967 to 1970 and chairman of the Joint Chiefs of Staff from 1970-1974, had been among the officers advocating for mining to cut off military supplies in bulk where they entered Vietnam, rather than trying to interdict individual trucks and sampans downstream from their supply points. Indeed, Haiphong had been mined before – starting in November of 1942. Thirty years later, the Easter Offensive provided the impetus and President Richard Nixon authorized the operation. The effect of Operation Pocket Money was substantial. At the time, 85 percent of all imports (including war materiel) and 100 percent of the oil needed by North Vietnam came through Haiphong harbor. After the mining effort started, the port was shut down to maritime traffic. Nothing larger than a fishing vessel left or entered the port until the United States swept the harbor after the Paris Accords. Air-delivered mines had shattered the sea-dependent supply line that North Vietnam relied on. Combined with the air interdiction efforts against Vietnamese rail transport in Linebacker I, Pocket Money arguably brought about the termination of U.S. involvement in Vietnam. The key to Pocket Money’s success, like earlier mining efforts, was that antiship mining is effectively an anti-commerce operation. Contemplating offensive mine warfare as a method of sinking naval vessels is missing the boat – mistaking the tactical effects from the strategic implications. The object of aerial mining is to strangle an opponent’s economy, disrupt seaborne logistics, and constrain power projection. In an increasingly globalized world, the implications of this kind of denial strategy are monumental. Pocket Money was the last hurrah of the air-delivered antiship mine. While the United States maintained them in the inventory, their utility lapsed as the danger of flying predictable, low-level mining patterns increased. In World War II, B-29s laid bombs from as high as 30,000 feet, but their accuracy was poor and large numbers didn’t even land in the water. Without the mass of entire bomb groups dedicated to aerial mining, release altitudes shifted down to improve accuracy with a much more limited number of mines. The last attempt to mine a seaway came during Desert Storm, when Jackal 404 (an A-6 Intruder) was lost attempting to mine the Um Qasr waterway on the third night of the war. The reason for this was the nature of mining deliveries. Aircraft have to slow down and go low to deliver mines – the first cluster of mines laid in Haiphong were dropped at 300 feet and 360 knots. Even then, the accuracy is low – placing a mine within hundreds of yards is accepted. To get a credible minefield, aircraft have to make multiple drops; timing and navigation are critical. Against an alerted adversary with the wherewithal to defend its own port facilities, minelaying is a suicide mission. Enter the Joint Direct Attack Munition (JDAM). In Vietnam the U.S. mine inventory gravitated away from purpose-built mines to conversions of general-purpose bombs, called Quickstrike mines. Fuse a bomb body to detonate on impact, and it’s a bomb. Add a guidance kit and it’s a precision weapon. Equip that same bomb body with magnetic/seismic sensors where the fuse would go, and it’s a mine. If the Pentagon could equip a bomb with a precision kit, then it could do the same with a Quickstrike mine. So it did – Enhanced Quickstrike mines were brand new weapons assembled entirely from components already in the inventory. The new Enhanced Quickstrike mines come in two flavors. The 2,000-lb version is the Quickstrike-J, which has the JDAM guidance kit attached and is commonly called the Skipjack. The 500-lb Quickstrike-ER version, called the Flounder, has both a JDAM-ER guidance kit and a pair of folding wings. They mirror the dimensions and weight of their JDAM siblings and have been dropped from the B-52, the B-1, and the F-18. Using the JDAM kits completely changed the employment concept as well. Now rather than making multiple passes at low altitudes and slow airspeeds, the minelayer can employ weapons at the same tactical airspeeds and altitudes as the JDAM. To make the conversion even more attractive, all of the mines can be released in one go, and the minelaying aircraft does not even need to overfly the minefield. The Flounders, with their extended range wing kit, can be released from distances exceeding 40 miles away. In 1972, the initial minefield in Haiphong’s inner channel consisted of 12 mines delivered by three A-6As using visual navigation and stopwatches. An Air Force bomber aircraft can now potentially lay several similar minefields in a single pass, and do it from standoff distances. With standoff weapons, stealth aircraft, or both, harbor mining is feasible again. With precision mining, the United States can place the weapons exactly where it wants them. While much attention is given to chokepoints like the Straits of Hormuz or the Straits of Malacca, mining efforts in those waterways would be a blunt instrument, wielded against belligerents and neutrals alike. Precision minelaying can now be tailored to a specific waterway in question, and it need not be in international waters. It is even possible to design a minefield that is a greater threat to vessels traveling in a specific direction (or its reciprocal). Harbor mining, no longer out of reach, might not only be specific to a country but specific to a cargo, allowing a great deal of selectivity that was previously unavailable. Should we want to prevent oil from entering or leaving a country, we need only mine the oil terminals or their approaches. Liquid petroleum is your target? Those facilities are few and far between and easily located. It is even possible to target certain coastal refineries, preventing specific products from being produced at refineries that have their own oil terminals. For potential adversaries like China or Iran, aerial mining is back on the table. China is almost completely dependent on maritime trade, relying on water transport for 98 percent of its international cargo movement (by tonnage) and half of its domestic movement (by tonne-kilometer). China’s land borders move a large amount of cargo that is nevertheless insignificant in terms of the larger whole. Iran, emerging from sanctions, is itself heavily reliant on seaborne trade. The National Iranian Tanker Company is the world’s fourth largest tanker fleet; six percent of all global seaborne exports come from Iran, including 2.3 million barrels of oil per day. Limiting Iran’s access to seaborne trade is a powerful strategic tool. Even the Russians are vulnerable, because they have so few ports. St. Petersburg alone handles more container traffic than the Russian Far East and Black Sea ports combined — a sixfold increase since 2000, all run through a single port complex at the far end of the Gulf of Finland. Unlike warships, commercial vessels have no damage control systems; any damage will send them to the nearest port – assuming the vessel is still seaworthy. Damage which would be contained on a warship can get progressively worse on a merchant hull, leading to its loss. Commercial vessels are also subject to insurance expenses, which can skyrocket in conflict zones and may cause shipping companies to avoid transit of dangerous areas. Under the Hague convention, all mined areas must be declared, but not all declared areas must be mined. The hidden benefits of a stealth weapon have advantages because of the uncertainty – once a declared area is mined, all declared areas are mined. One explosion is proof enough for commercial entities. Not only does an individual mine not have to function to be effective, it may not even have to be emplaced to be effective. There are tactical benefits from closing access to a submarine pen or damaging the occasional warship. There are strategic benefits from interrupting access to war materiel, interdicting maritime transport, and inhibiting the movement of surface vessels. In an anti-access environment where the ability to penetrate deep into protected airspace is questionable, the Enhanced Quickstrikes offer a cost-effective, persistent threat that is difficult and time consuming to counter. In a globalized world, the new mining capabilities offer a significant asymmetric advantage for the Joint Force – if used correctly. Col. Mike “Starbaby” Pietrucha was an instructor electronic warfare officer in the F-4G Wild Weasel and the F-15E Strike Eagle, amassing 156 combat missions and taking part in 2.5 SAM kills over 10 combat deployments. As an irregular warfare operations officer, Colonel Pietrucha has two additional combat deployments in the company of U.S. Army infantry, combat engineer, and military police units in Iraq and Afghanistan. Hellfire, kiduva21 and BMD like this. May 24 (UPI) -- The Pentagon plans to deploy eight additional ground-based interceptor missiles at Fort Greely, Alaska, according to the U.S. Missile Defense Agency. Japanese television network NHK reported Tuesday the U.S. military is adding eight more missile defense systems and "updating" its sea-based X-band radar to deter against North Korean threats. The SB-X is the world's largest and most powerful phased array X-band radar in the world, and is housed inside a dome that resembles a giant golf ball. The system's electric thrusters can propel the radar to be positioned in any location in the Pacific Ocean, according to the Missile Defense Agency. A total of 44 ground-based interceptor missiles are to be deployed to Alaska to "improve protection against North Korean and potential Iranian [intercontinental ballistic missile] threats as they emerge," the MDA states. An X-band radar deployed to Japan will also receive an upgrade so as to improve the system's ballistic missile tracking capabilities. North Korea has claimed its midrange missiles, like the recently test-launched Hwasong-12, can target U.S. assets in Guam and Japan. An X-band radar currently deployed in the Pacific for 120 days per year will be upgraded so it is operational year-round. The report comes after the U.S. House Armed Services Committee called for a $2.1 billion increase in military spending in the Pacific, due in part to the potential North Korean threat. About $1 billion is being allocated to munitions and another $1 billion for missile defense, including Terminal High Altitude Area Defense, or THAAD. THAAD is already operational in central South Korea. Officials won’t say it’s because of North Korea. But experts say Pyongyang’s planned ICBMs will almost certainly release decoys to cloak their nukes. The Missile Defense Agency, or MDA, is accelerating the development of an interceptor that can take down several incoming warheads — or one warhead and several decoys — simultaneously. While MDA officials say the move is not a response to any specific threat, one prominent defense watcher notes that North Korea is likely working hard on missiles that can fire decoys to confuse interceptors. The most recent Pentagon budget request seeks $259 million to move the Multi-Object Kill Vehicle, or MOKV, program into a new development phase — and speed up its projected completion by five years. “We have accelerated MOKV risk reduction and product development phases to achieve a demonstrated capability in the 2025 timeframe,” said an MDA official in an email to Defense One. MDA’s decision to accelerate the MKOV program is, in part, a vote of confidence in recent technological gains. On Tuesday, Boeing announced that MDA had awarded the company a $58 million, 35-month contract, to demonstrate their MOKV design. “Our MOKV concept gives the Missile Defense Agency flexibility in eliminating threats more efficiently and affordably,” Paul Geery, a vice president of Boeing Phantom Works, said in a press release. How far along is North Korea in developing a missile that can shoot decoys and more easily avoid interception? In March, Defense One put that question to Mitch Stevison, vice president of Raytheon Missile Systems. David Wright, the co-director of the Union of Concerned Scientists’ Global Security Program, was a bit more forthcoming. “It’s very likely that [North Korea] is working on [missile interceptor] countermeasures of various kinds, including adding multiple decoys to its missiles, and this is something it should be able to do. Since the decoys are intended to work above the atmosphere (as is the kill vehicle) they can be very lightweight, so you avoid the problem of too much mass,” Wright said. “Too much mass” is a key reason why North Korea has not yet been able to put a 650-plus-kilogram nuclear warhead atop an ICBM that could hit the United States. In 2000, the Union pulled together a group of experts to assess next-generation missile countermeasures. Wright says that the basic conclusions of their report, including the likely use of decoys, still hold up. MDA hopes to develop and test “command and control strategies in both digital and hardware,” in 2017, an agency official toldScout Warrior in February. USS Gerald R Ford is the first new aircraft carrier design in 40 years. Almost 8 years after construction began on new class of aircraft carrier, the first of 3 has been delivered to the Navy. The Ford class is similar to the Nimitz class but features better design to accommodate more aircraft. BMD, kiduva21, Hellfire and 3 others like this. A mighty beast. US engineering at its best. It need not refuel before 2040. Ground forces will test ability to project sea control from land with mobile missile systems. Speaking at an Army symposium last week, U.S. Pacific Command head Admiral Harry Harris revealed that the U.S. Army and the Japanese Ground Self Defense Force will sink a target ship (SINKEX) with shore-based anti-ship cruise missiles (ASCM) at next year’s Rim of the Pacific Exercise (RIMPAC). Since at least last year, U.S. officials have advocated for ground forces to develop an anti-ship capability as part of the Multi-Domain Battle concept as a way to utilize services other than the U.S. Navy to exert sea-control in a hypothetical clash in the Western Pacific. RIMPAC is the world’s largest multinational naval exercise, held every two years in the waters around Hawaii. The exercise in 2016 involved forces from 26 countries, including 45 ships, 200 aircraft, and over 25,000 personnel. That exercise showcased the first test of a Harpoon anti-ship cruise missile fired from a Littoral Combat Ship (though the missile failed to hit its target), and reinvigorated a logistics capability to sustain fuel supplies to the fleet at-sea. Expanding the lethality of the Navy’s surface fleet and giving the fleet’s fuel supplies greater range and sustainability are crucial capabilities for a potential clash with the growing Chinese fleet in the Western Pacific where the U.S. may find its traditional fuel logistics hubs under threat from long-range Chinese missiles. The U.S. Army will be firing the Naval Strike Missile (NSM), a multi-purpose, subsonic cruise missile designed by Norway’s Kongsberg and built in partnership with Raytheon. While subsonic, the missile is low-observable and maneuverable. With a range of just over 100 nautical miles, it has greater reach than the U.S. Navy’s aging Harpoon anti-ship missiles, but far less than advanced Chinese supersonic anti-ship cruise missiles like the YJ-18, which the U.S. Department of Defense assesses may have a range of nearly 290 nautical miles (though other analysts place the range closer to 120 nautical miles). By selecting the NSM to test, Pacific Command has reduced the development and training burden leading up to next summer’s exercise as Kongsberg already produces a truck-mounted coastal defense version of the NSM for the Polish Navy. The Japanese Ground Self Defense Force already fields the Type 12 ASCM, a truck-mounted, subsonic missile with a range just over 120 nautical miles, and is developing an improved ASCM with a range of at least 180 nautical miles. Admiral Harris said that creating an expeditionary anti-ship capability in the U.S. Army helps “address some of the tough problems that we face together in archipelagic defense scenarios.” Integrating such a capability with those of allies and partners like Japan is equally significant. Unspoken in Admiral Harris’ invocation of “archipelagic defense scenarios” is that these capabilities are being developed to deal with a potential clash with China. +1 for the Norwegian defence industry. kiduva21, Gessler and Hellfire like this. The Air Force now says it wants a total future bomber fleet to be around 165 aircraft — not just its fleet of B-21 Long Range Strike Bombers. Testifying before the House Armed Services Committee’s Seapower and Projection Forces Subcommittee on May 25, Lt. Gen. Jerry D. Harris, deputy chief of staff for strategic plans and requirements, was asked about increasing the planned quantity of B-21 Raiders — the Air Force’s future stealth bomber set to join the fleet in the mid-2020s. The service plans to spend more than $55 billion to acquire 100 of the next-generation aircraft as part of the Long Range Strike Bomber, or LRSB, program. Rep. Mike Gallagher, R-Wis., questioned whether the Air Force should buy more of the bombers, which will be designed in part to fight through surface-to-air missiles and protect coalition aircraft and drones. “Can you give us the strategic logic that allowed you to arrive at the 100, or at least 100 number?” Gallagher asked during the hearing. “And certainly [Lt. Gen. Michael] Moeller agrees and calls for as many as 200 B-21s,” Gallagher noted, referring to an analysis study from the retired Air Force general, also a former deputy chief of staff for strategic plans and programs. The 165, however, “refers to the total number of bombers, not the number of B-21s,” Air Force spokeswoman Ann Stefanek later clarified to Military.com. The back-and-forth conversation between the generals and lawmakers created confusion over what Harris was referring to, Stefanek said. 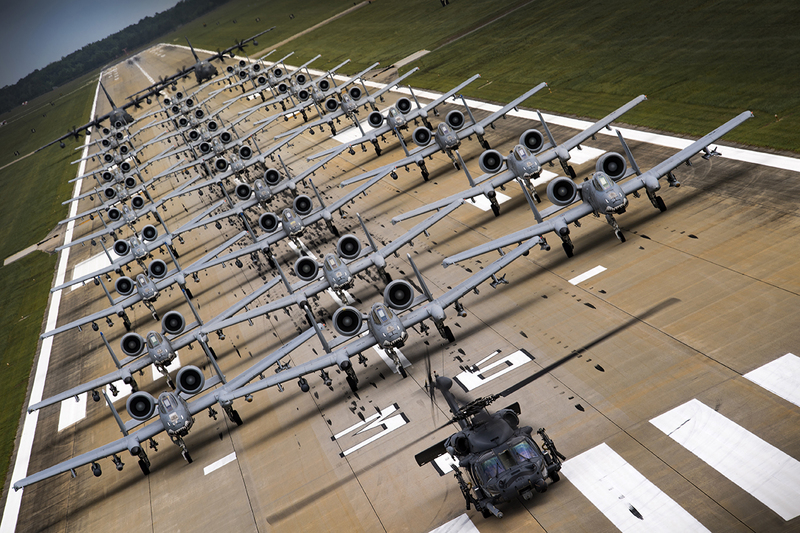 The Air Force currently has 62 B-1B Lancers, 20 B-2 Spirits, and 77 B-52 Stratofortresses, totaling 159 bombers, she said. 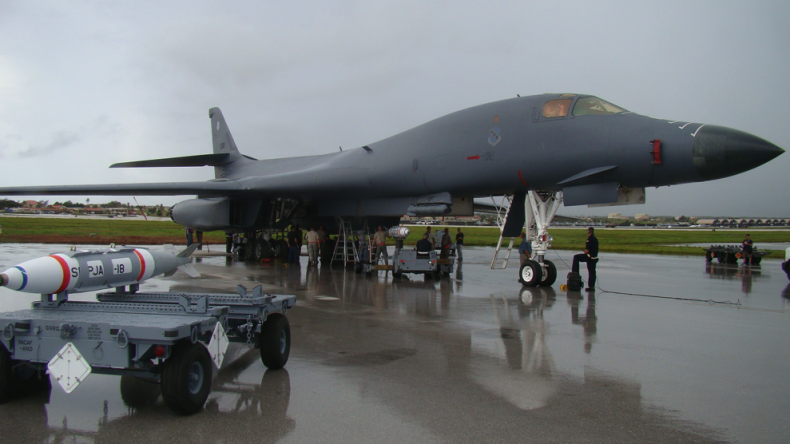 The service in 2015 awarded an initial contract to Northrop Grumman Corp. to begin developing the B-21, which will eventually replace a portion of the B-1 Lancer fleet. But Stefanek could not say how the numbers would be reapportioned to reach 165 bombers. The service maintains it wants to procure 100 of the Raiders, named after the Doolittle Raiders. The B-21 is estimated to cost $550 million per aircraft in 2010 dollars, according to the Pentagon. Dagger, Hellfire and Gessler like this.